The Office of Abandoned Mine Lands and Reclamation was created to manage the reclamation of lands and waters affected by mining prior to 1977. Most of the residents and businesses in Preston County, West Virginia were affected by the poor water quality from the well water supply due to mining that took place prior to 1977. 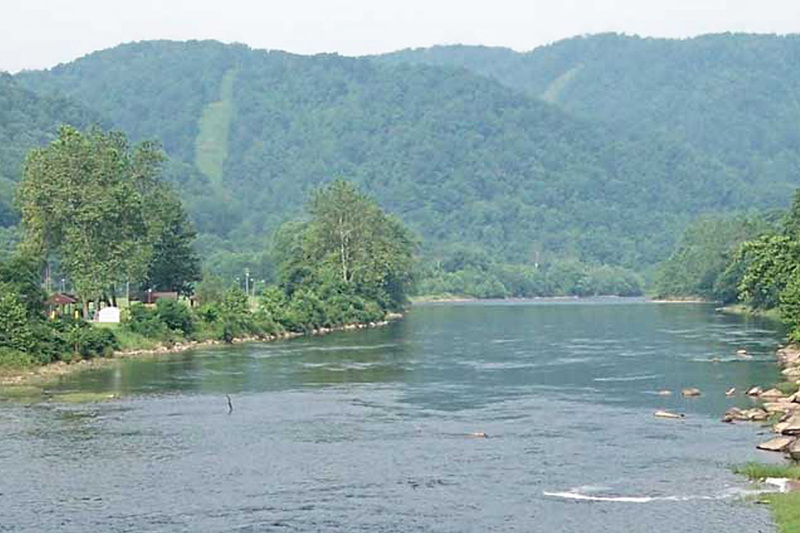 Like many counties in the United States, Preston County recently received a grant from the Abandoned Mine Lands to extend municipal water services to residents and businesses in the County from a nearby water treatment plant. The first phase of the project included six prefabricated housed systems provided by Metropolitan Industries. Three pressure reducing valve systems and three booster systems were supplied to the county in an effort to service 300 new customers along the hilly and rugged terrain of Preston County. The elevation change from the highest point to the lowest point is 1,200 ft. With this in mind, accommodations were made to assure that the water pressure was distributed equally throughout the entire county. The exterior of each housed system is concrete to provide the best durability and a quality installation for the longevity of the house, insulation and vandal resistance. The equipment supplied helps keep the pump stations functioning as efficiently as possible to help lower energy consumption with variable speed pumps to save money as well. 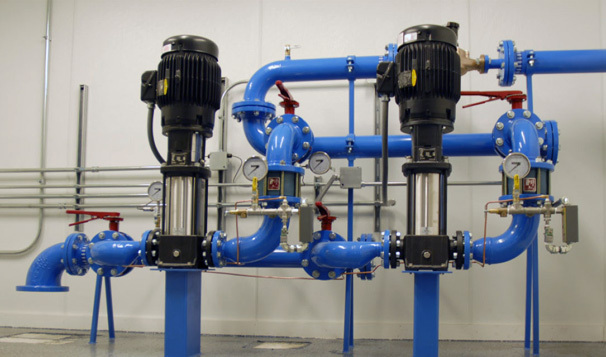 The pumps are vertical multi-stage with low flow and high heads designed to operate across a wide range of speed. Touch screen control panels make the product easy to use. The grant also helped fund a 40 mile waterline extension to the local public service district, requiring the addition of the new housed systems. 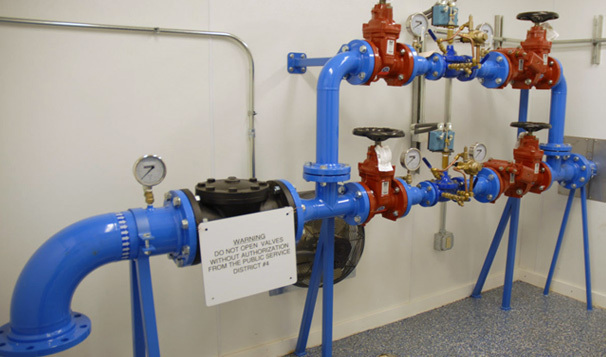 As part of a comprehensive water distribution project, Stantec Project Manager, Jeff Boyles describes the housed systems as an exciting design from a hydronic engineering standpoint. The general contractors felt the prefabricated housed systems delivered were of a quality that could not be matched. 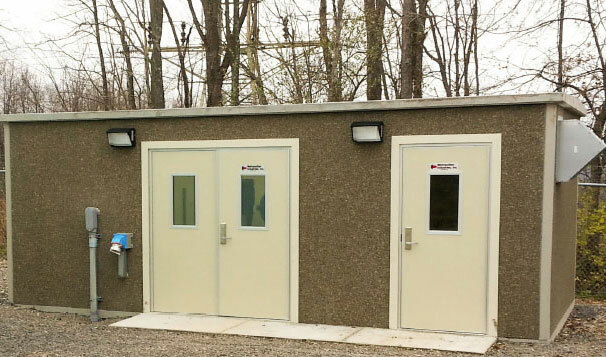 All six of the housed systems we supplied to Preston County have been delivered and are presently in the start-up process. Each housed system was prefabricated in our shop and shipped “ready to install” to the customer. The West Virginia Office of Abandoned Mine Lands oversees and facilitates the resolving of public safety issues as mine fires and subsidence, hazardous highwalls, mining-impacted water supplies, open shafts and portals, and other dangers resulting from mining before 1977. Preston County was fortunate to be granted funding for this project so that the residents and businesses can have the best quality of water supplied to them. The exterior of one of three booster systems delivered and installed to one of the six stations in Preston County.